Cut cauliflower from stalk, place in a crock pot, put vegetable broth and garlic in the crock pot. Cover and cook until tender, about 2-4 hours on low. Transfer everything from crock pot into a blender. Add coconut milk and yogurt to the blender. Blend until pureed. Transfer to four bowls. In a skillet, over medium-high heat, cook dried fruit, cranberries, pepitas and/or pine nuts with sugar, garam masala spice, and water. Stir and cook until sugar crystallizes over the fruit. Sprinkle over soup. Garnish with dollops of Yoplait® Greek yogurt, if desired. Also good for garnish: fresh chopped mint. Ready to warm those winter bones with a meal so sastifyingly delicious you'll feel like you're sitting on an elephant, riding through the streets of New Delhi? Yeah, I thought so. 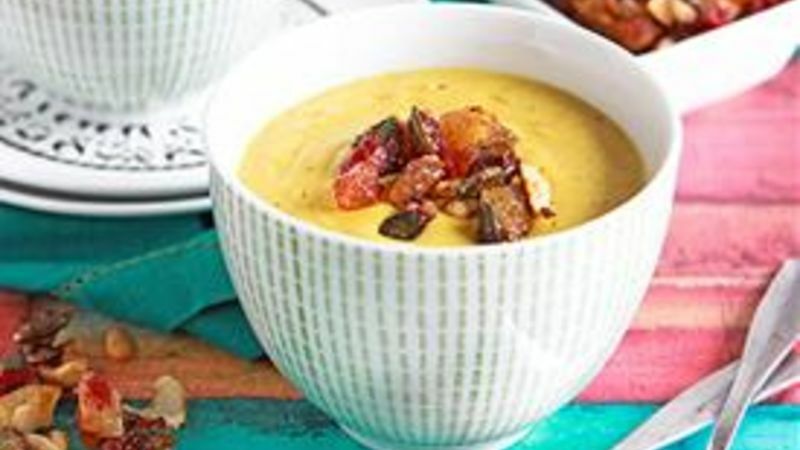 Which is why I pulled together this Slow Cooker Indian Curried Cauliflower Soup. Any recipe so bold, it holds up to an 8-word title? It should be in your life, now. Ingredient line-up! Can we get a hooooo-raaaah for how easy this recipe lineup looks? BAM! That's how we do dinner. And if you think that recipe LINE UP looks easy…just you wait until you see the actual recipe making. Hullo, speed-of-light! Well, crock pot speed, but anyway, it's so easy. Check it. Then toss the streusel onto a sheet of parchment or foil and let it cool. Then spoon, streusel, and try to keep yourself from diving face-first into the bowls of utter goodness. Um, hi there. Did we just recommend that you DON'T dive into those bowls? As if. Grab a spoon and go, yo. You're not going to ever want to come back. Brooke blogs at Cheeky Kitchen, where she shares fun family recipes. She joined Tablespoon to share some of her best, so keep an eye Brooke's profile to see what she cooks up next!